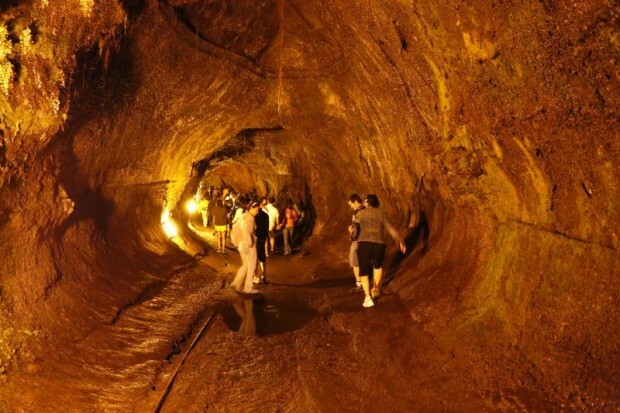 A 71-year-old Japanese tourist died on Thursday after suffering an apparent heart attack at Thurston Lava Tube in Hawaii Volcanoes National Park. Part of a tour group exiting the cave around 1:00pm, Acting Chief Ranger John Broward reports that the man felt fatigued, was short of breath, and sat down to rest before he collapsed, lost consciousness and stopped breathing. Several visiting nurses and a tour operator performed CPR until park rangers arrived with an automated external defibrillator, or AED. Rangers went through three cycles of CPR and AED analysis but the man’s heart was not in a rhythm the machine could detect. Eventually County of Hawai’i Medic 19 arrived and assumed care. After county medics completed their protocols, a doctor from the Hilo Medical Center pronounced the visitor dead through online medical control. The incident occurred shortly after walking up the steepest section of the trail. The name of the victim is being withheld pending further notification of his family.